To really understand Phoenix, you have to find the canals. The canals bring water into Phoenix for agriculture, irrigation, and for the daily needs of everyone who takes a shower, or makes a cup of coffee. I'm enjoying some coffee right now, brewed with genuine Salt River water, with a bit of the Verde River added in, for taste. I've known people who've lived in Phoenix all of their lives, or for a very long time, and have no idea what, or where, the canals are. They're water from the Salt and Verde Rivers, which begins as snow melt, is dammed, and then gently released all over the valley. I like to call them the "gentle rivers of Phoenix" and they're always flowing, and have been since the 1800s. And yes, there are fish in them. By the way, I know that a lot of people tend to call anything with water in it a canal. And I know what they mean. Of course there are very few canals - north of the Salt River the two main ones are the Arizona Canal and Grand Canal. The water that you see flowing, for example, along Central Avenue isn't a canal, it's a lateral. That means that it takes water from the canal, and brings it where it's needed. When I lived in Tempe, back in the '80s, there was an open lateral in front of the place where I lived, running parallel to Wildermuth. It's been covered up now, but it's still there. There are also storm drains, most of which in the valley are the old abandoned canals, like the old Cross-Cut Canal, which is along 48th Street, or Swilling's Ditch, which is over by the Circle K on Van Buren and 32nd Street. When the canals stopped being used to bring water in, they were converted into drains that take rain water away. So if you call everything from canals to laterals to storm drains "canals", that's OK, I know what you mean. I'm glad that you see them, because to really understand Phoenix, you have to follow the water. 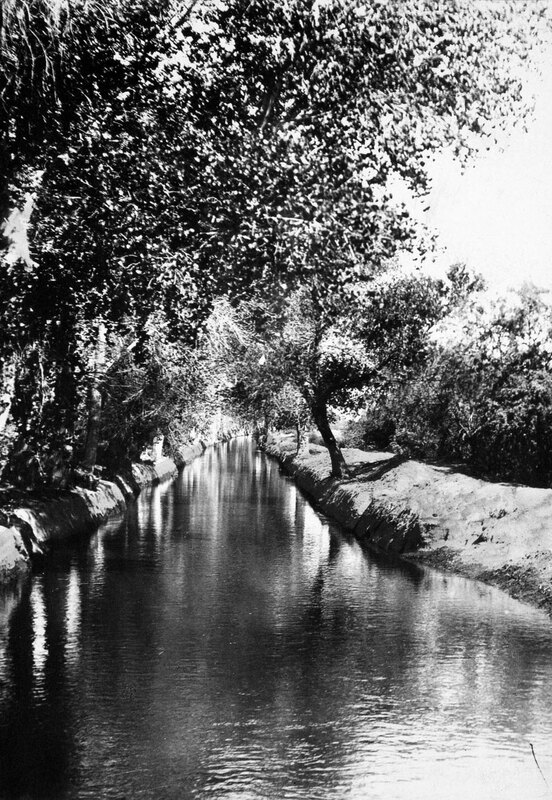 Image at the top of this post: the Arizona Canal in the 1890s, Phoenix, Arizona. Back in those days there were very few bridges over it, so it was a problem to cross. Now there are so many bridges over it that few people even realize that it's there.